Don't forget, I have my little US-only giveaway, and I'm also a part of a huge multi-blogger giveaway that's open to everyone! Today, I have a polish that fits the Halloween season quite well, even though it wasn't intended to be a Halloween polish! Femme Fatale Vortex Remnants is a deep, red-toned purple jelly filled with red and purple diamonds, stars, and hexagons. Some of the glitters have a holographic finish, so they glow and sparkle beautifully beneath the jelly. As with most glitter-filled jellies, application was a bit "sticky," but not too terribly difficult. Dry time was slow. I used two coats. I strongly encourage using a glitter-smoothing top coat (such as Gelous or Glitter Food) followed by a thick quick-dry top coat (like Seche Vite). Dark and magical, right? 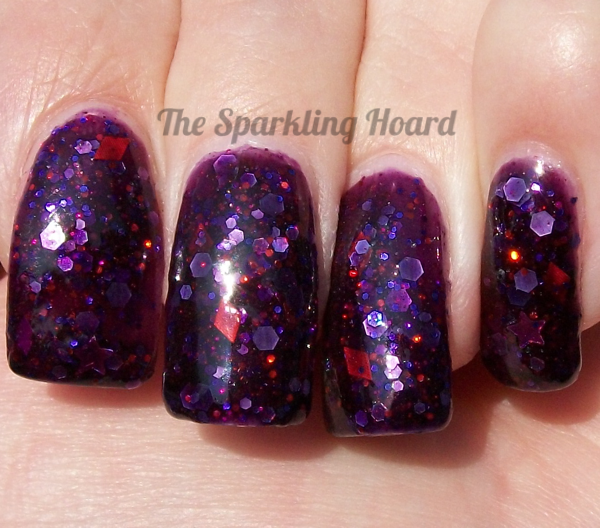 This polish makes me think of witches...though maybe that's just because I watched AHS: Coven last night! Keeper of the Grove costs $12.50 for 12mL at Color4Nails. Femme Fatale polishes are also available directly from Femme Fatale (Australia), Norway Nails (Norway), Harlow & Co., and Ledouxnuage (France). To stay up-to-date on upcoming Femme Fatale polishes, Like their Facebook page. 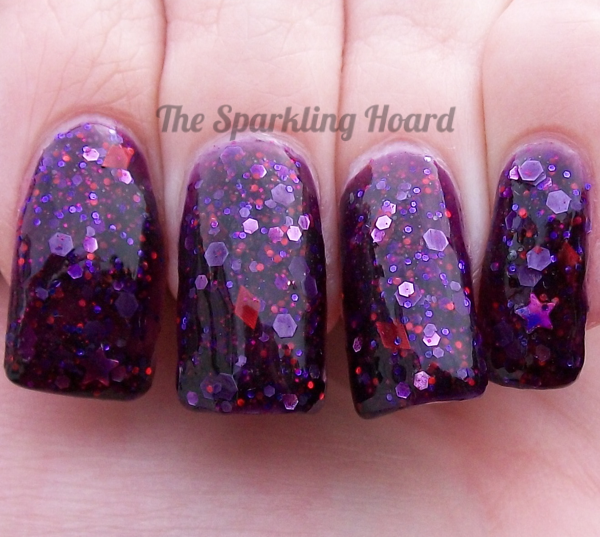 This looks gorgeous -- so vampy :) I love the squishy jelly texture! Love this polish! I don't think I've ever seen it before.